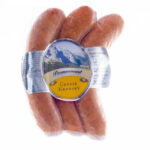 Our kransky style broadly follows the time honoured Austrian recipe used by many continental smallgoods makers. 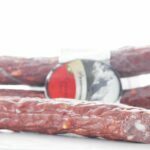 Offering three variations of mild, hot and the more robust, cheese, our kransky is based on sea salt, garlic and black pepper. 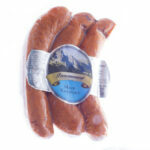 Toasty smoke provides a vibrant golden colour and flavour with a satisfying heady aroma. 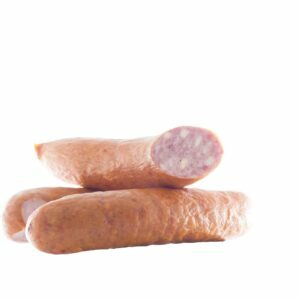 Serve our kransky as a warm snack, barbecued whole on a grill, or like a hot dog with tomato sauce, mustard or chilli in a dark rye roll. We are very proud to announce that our Cheese Kransky won a Silver medal at the 2016 Australian Food Awards ! 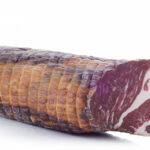 Other Information: Natural Casing, No Added MSG, No Added Gluten, Naturally Smoked, Australian Pork. 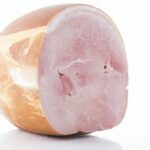 Ingredients: Meat (89%), Water, Starch, Salt, Spices, Edible Animal Casing, Mineral Salts (450, 451, 452), Maltodextrin, Vegetable Powder, Antioxidant (316), Hydrolysed Maize Protein, Sodium Nitrite (250), Colour (129).